Being Vegan for three Years – How to start? Benefits? wait whaaaaat?! Ich bin schon 3 Jahre lang Veganerin? Ich glaube es selber noch nicht, und schaut an ich lebe sogar noch und damn… so wie meine Oma sagen würde „Dafür das du dich so gesund ernährst bist du gar nicht mal so dünn“. Die Frau bringt mich immer zum lachen, aber recht hat sie und kaum zu glauben, ein Defizit an Protein habe ich auch nicht. Im heutigen Post gehe ich auf ein paar Sachen ein, die sich durch das vegan sein verändert haben und beantworte ein paar Fragen zu Rezepten, Veränderungen und wie man am besten beginnt! Meine Ernährungsumstellung war wohl die beste Entscheidung die ich treffen konnte! Was meine Familie noch als Phase abgestempelt hat, geht jetzt bereits 3 Jahre lang und es wird sich auch nicht mehr ändern. Ich stehe zu 100% hinter der veganen Ernährung. Natürlich wimmelt es im Moment nur so von Veganern auf Social Media, was ich auch super finde, jedoch sieht man zwar die farbenfrohen Buddha Bowls und Früchte Platten, aber wie genau eine Umstellung aussehen kann oder realitätsnahe Rezepte gibt es kaum, daher werde ich hier ein paar Dinge aufklären und die meistgestellten Fragen zum veganen Lebensstil beantworten! 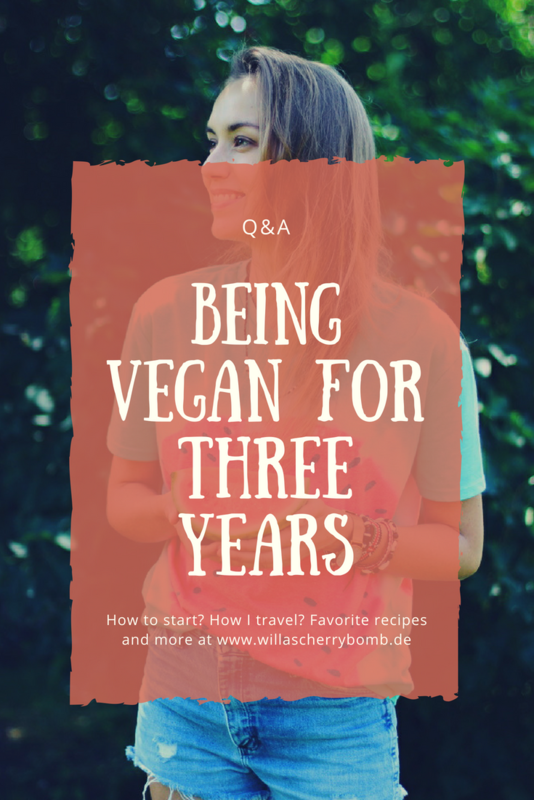 Being Vegan for three Years – Q&A! Wie kann ich am besten mit meiner Ernährungsumstellung beginnen? Damals hätte ich gesagt „Fang einfach an“ und das ist auch immer noch der schwerste Teil an der ganzen Sache, nämlich den Schritt zu gehen und anzufangen, allerdings würde ich euch raten euch vorher genau zu erkundigen, vielleicht Dokumentationen wie „What the health?“, „Cowspiracy“ oder/und „Forks over knives“ zu sehen, damit man vor Augen hat, was man all die Jahre unterstützt hat und um die Motivation zu haben, nicht bei den ersten kleinen Problemchen hinzuschmeißen. Zudem solltet ihr schonmal nach Rezepten schauen für eure Lieblingsgerichte, die normalerweise tierische Produkte beinhalten. So müsst ihr dann auch nicht auf euer liebstes Essen verzichten. Wenn Not am Mann ist, gibt es mittlerweile auch so viele vegane Fertigprodukte, vor allem bei Edeka, Kaufland und Rewe, da gibt es sogar vegane Leberwurst! Was sind deine liebsten Rezepte? Welche Veränderungen konntest du nach 3 Jahren veganem Lebensstil verbuchen? Energie Energie Energie! Ich habe viel mehr Energie, gehe mittlerweile sogar Joggen weil ich es mag und nicht weil ich das Gefühl habe ich sollte, sowas hat damals eh nicht hingehauen. Zudem habe ich mich durch den veganen Lebensstil immer mehr mit mir und meiner Umwelt beschäftigt und denke jetzt mehr darüber nach was ich konsumiere. Ich habe natürlich auch ungesunde Tage, sowas geht auch als Veganer und ich merke auch diese Auswirkungen auf meinen Körper. Ich lebe im Allgemeinen viel bewusster! Welche Probleme gab es bei der Umstellung? Ich hatte keine großen Probleme, ehrlich gesagt bin ich immer noch überrascht wie reibungslos alles verlaufen ist. Selbst meine Omi, die jeden Sonntag Fleisch für die Familie kocht, war super interessiert und ich habe ihr vegane Rezepte gezeigt. Sie war total baff als ich vegane Muffins gebacken habe, oder wie sie sie nennt „Törtchen“. Backen ohne tierische Produkte war etwas an das sie nie gedacht hat. Ansonsten musste mein Körper sich natürlich an die Massen von Früchten und Gemüse gewöhnen, das ging nicht von heute auf morgen. Ich befasse mich sehr mit Essenskombinationen und versuchte keine Rohkost mehr nach gekochtem Essen zu konsumieren. Das ist alles so eine Theorie, die bei mir eher nicht gestimmt hat. Habe mir sogar jetzt noch vor kurzem den Magen verdorben, also nur weil man vegan lebt, heißt es nicht, dass man nie Magenprobleme bekommt. Zumindest bei mir ist es leider nicht der Fall. Wie war es als Veganerin um die Welt zu reisen? Aufregend! Man muss sich immer wieder neu auf die Länder oder sogar nur Städte einstellen. Ich habe auch Eier und Käse ab und an essen müssen, da zum Beispiel auf Touren für mich die Alternative gewesen wäre zu hungern und das wollte ich natürlich nicht. Ich denke das ist auch noch ein wichtiger Punkt, denn man sollte alles nicht immer so ernst nehmen. Es gab früh morgens bei der Tour nur Ei? Gut muss ich es halt essen, da ich die Energie für die Wanderung brauche, das heißt aber nicht das ich nun alles hinschmeiße, sondern ich nehme es so hin und lebe meinen veganen Lebensstil weiter. Ich erlebe es oft, dass Leute sagen „Du darfst das nicht essen, weil du Veganerin bin“, das hat allerdings mit „dürfen“ nichts zu tun, ich will einfach nicht. Um zurück zur Frage zu kommen, in manchen Ländern ist es einfacher als in anderen. Zur Not habe ich es immer geschafft Brot mit Tomate und Gurke oder sogar Erdnussbutter zu essen. Ansonsten kann ich noch die Website „HappyCow“ empfehlen, dort kann man explizit nach veganen Restaurants in der Nähe suchen. Legst du Wert auf vegane Kosmetik und Kleidung? Generell ja! Allerdings ist es mir heute erst passiert, dass ich ausversehen Leder Sandalen im Second Hand Laden gekauft habe, die ich nun auch direkt bei Kleiderkreisel reingestellt habe. Ich möchte keine Tierhaut tragen und sortiere auch momentan meine Kosmetik Sammlung aus. Ich trage zwar sehr selten nur noch Make-up daher möchte ich meine Reste noch aufbrauchen, aber nachkaufen mache ich nur bei Naturkosmetik. Habe letztens erst den Eyeliner von Alverde gekauft und fand ihn klasse! Habt ihr noch weitere Fragen? 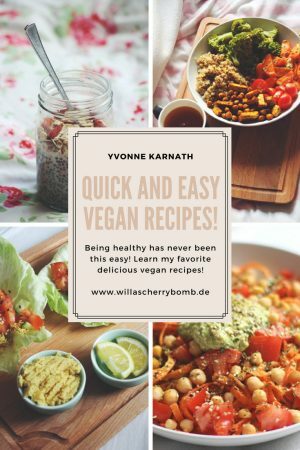 Falls ja, hinterlasst sie mir in den Kommentaren oder schickt mir eine E-Mail an willascherrybombblog@gmx.de Mehr zum Thema veganem Lebensstil auf meinem Blog, könnt ihr in diesen Blogposts finden! Wait whaaaaat ?! I have been a vegan for 3 years? I do not believe it myself, and look on I live even and damn … as my grandma would say „For you to eat so healthy you are not even so thin“. The woman always makes me laugh, but she’s right and it’s hard to believe that I do not have a protein deficit either. In today’s post I go into a few things that have changed through being vegan and answer a few questions about recipes, changes and how to get started! My diet change was probably the best decision I could make! What my family has labeled as a phase has been going on for 3 years and it will not change. I’m 100% behind the vegan diet. Of course, vegans are currently big on social media, which I think is great, but you can see the colorful Buddha bowls and fruit plates, but how exactly a conversion can look like or realistic recipes are rare, so I’m here clarify a few things and answer the most frequently asked questions about the vegan lifestyle! Being Vegan for three Years – Q & A! What is the best way to start my diet change? At that time, I would have said, „Just start“ and that’s still the hardest part of the whole thing, to take the step and start, but I’d advise you to inquire before, maybe documentations like „What the health? „,“ Cowspiracy „and / or“ Forks over knives „to see what you’ve been supporting all these years and to have the motivation not to throw in the first little hiccups. In addition, you should always look for recipes for your favorite dishes, which usually include animal products. So you do not have to do without your favorite food. If there is a need, there are now so many vegan products, especially at Edeka, Kaufland and Rewe, there is even vegan sausage! What changed after 3 years on a vegan lifestyle? Energy Energy Energy! I have a lot more energy, I even go running now because I like it and not because I feel like I should. In addition, the vegan lifestyle has made me more and more focused on myself and my environment, and I am now thinking more about what I consume. Of course I also have unhealthy days and I notice these effects on my body. I generally live much more aware! What were the problems with the conversion? I had no big problems, to be honest, I’m still surprised how smooth everything went. Even my grandmother, who cooks meat for the family every Sunday, was super interested and I showed her vegan recipes. She was totally baffled when I baked vegan muffins or what she calls „tartlets“. Baking without animal products was something she never thought about. Otherwise, of course, my body had to get used to the masses of fruits and vegetables, which did not work overnight. I am very much concerned with food combinations and did not try to consume raw food anymore after cooked food. It’s all a theory that did not suit me. I’ve even recently tainted my stomach, so just because you live vegan, does not mean that you never get stomach problems. At least for me it is unfortunately not the case. How was it to travel around the world as a vegan? Exciting! You have to adjust again and again to the countries or even cities. I also had to eat eggs and cheese from time to time, because, for example, on tours for me would have been the alternative to starve and of course I did not want that. 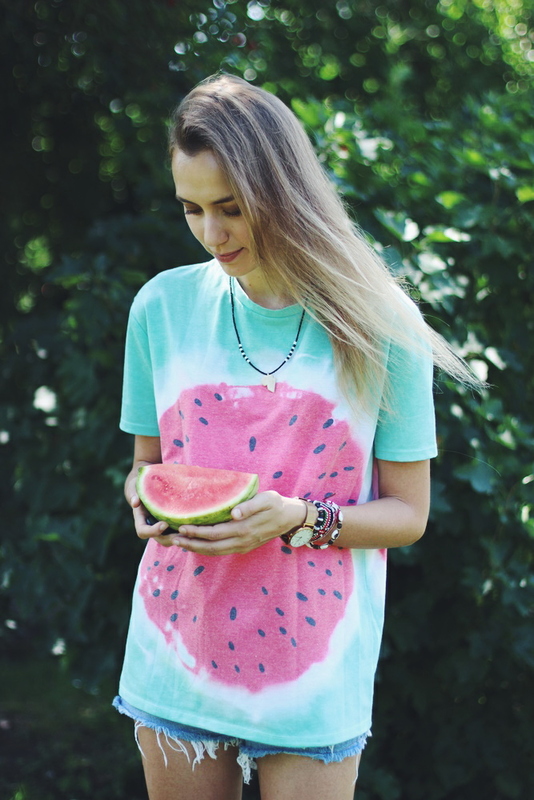 I think that is also an important point, because you should not always take everything so seriously. There was only egg early in the morning on tour? Well, I have to eat it because I need the energy for the hike, but that does not mean I’m going to throw it all away, but I take it that way and continue my vegan lifestyle. I often hear people saying, „You can not eat this because you’re vegan,“ but it has nothing to do with „can,“ I just do not want to. To get back to the question, it is easier in some countries than in others. If necessary, I have always managed to eat bread with tomato and cucumber or even peanut butter. Otherwise, I can still recommend the website „HappyCow“, there you can explicitly search for vegan restaurants nearby. Do you value vegan cosmetics and clothing? Generally yes! However, it only happened to me today that I accidentally bought leather sandals in the second hand shop, which I have now also put directly in Kleiderkreisel. I do not want to wear animal skin and sort out my cosmetics collection at the moment. Although I very rarely wear make-up so I would like to use up my leftovers, but I only buy natural cosmetics. Have only recently bought the eyeliner from Alverde and think it is great! Do you have any further questions? If yes, leave it in the comments or send me an email to willascherrybombblog@gmx.de More about vegan lifestyle on my blog, you can find in these blog posts! 10 Fehler die man als Veganer vermeiden sollte ! Gedankenpost – Verschwende deine Reise nicht! Wirklich sehr spannend. Toll, dass vegan leben für dich nun schon so lange so gut für dich funktioniert. Wie schön, dass du so eine tolle Erfahrung mit deinem neuen Lebensstil machen konntest 🙂 Ich selbst bin keine Veganerin und kann es mir auch nicht vorstellen, aber ich konsumiere bewusst wenig Fleisch, da ich der Meinung bin, dass es in viel zu großen Massen konsumiert wird. Ich find das sehr spannend mit der veganen Ernährung! Habe ich auch schon mal überlegt.